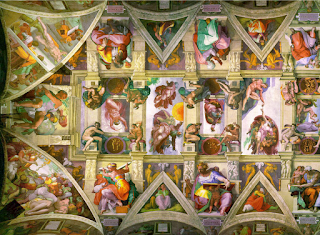 The ceiling of the Sistine Chapel, painted by Michelangelo. A named Renaissance artist from Italy. You study two different types of artist in this chapter: artists from Italy, and artists from outside Italy. The paper always makes it clear which it's asking for, but always be careful, because everyone makes mistakes sometimes. Most of the time, you have a choice between two Italian artists, Leonardo da Vinci and Michelangelo. The advice on this page can apply to both. First, name your artist. Who is he? When was he born? Where was he born? Next talk about his training. Where did he train? Who was his patron? What did he do after his training? Did he travel? Who did he work for? This is a good point to describe some of that artist's works. It's best to have three examples, so for Leonardo you could describe the Mona Lisa, the Last Supper and the Virgin on the Rocks. For Michelangelo, you'd talk about David, the Pieta and the ceiling of the Sistine Chapel. Don't forget to explain everything about these works, such as the terms fresco and sculpture. Once that's done, talk about other things the artist did. In Leonardo's case, you'd talk about his inventions. Michelangelo answers would have his work on the Dome of St. Peter here. When you've finished, end your answer just by mentioning when and where the artist died. Name and introduce your artist. Talk about his training and patron. Describe what he did after his training. Describe three examples of his works. Talk about other things the artist did. Finish up with his death. get confused between Leonardo and Michelangelo. It can happen, so be careful! say "Hi, I'm Michelangelo..." Like I said, this has to be in the third-person (describing other people). name a term (like fresco or perspective) and then not explain it. You always get marks for explaining terms. write anything irrelevant (unimportant). It is important that Leonardo painted the Mona Lisa. It is not important that he had a big white beard. Fantastic Advice! Perfect for the Junior Cert! Thanks! Hi, the tips above should help you find 8 points to write in your answer. Have a go and get back to me if you're still stuck. Best of luck! does anyone know the name of the artist that michelangelo became an apprentice to at 13?? thanks again.sorry about this- the exam is tomorrow!! He was apprenticed to Ghirlandaio. Keep an eye on your notes and the textbook you're using. This is great advice...finally understand a people in history. Thanks very much. I'm afraid I can't do your homework for you. Check your book and your notes, and hopefully the guide on this page will help you to structure your answer.